Maybe you've noticed the neon word floating subtly above our heads while we scoop ice cream: happy. It's our goal, not just for ourselves, but for our ice cream. We don’t want to stop at scooping a cool, chilly dessert. We want to hand you a cone of cheer. And most of the time, our ice cream is itself a celebration: marking a birthday or the end of a long week, or bringing together an entire family for graduation. But sometimes, ice cream is more convenient than celebratory. And we know how close we are to the hospital. How convenient. It’s a challenge we will always accept: to scoop cheer to the patients, loved ones, doctors, and nurses of our neighbors, whenever we can. 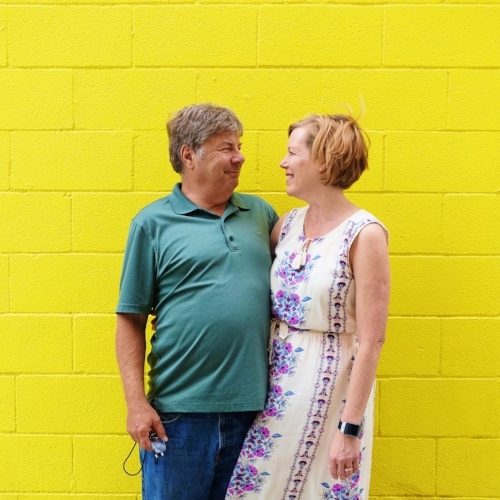 A few months ago, some of those loved ones waiting at a hospital were part of our MELT family: Jane and Dan Moughon. Jane had read about MELT before it opened, and “we were hooked from the first time,” Dan said. They’ve been coming about once a week since, according to Jane, and when they’re sick, Dan still makes the trip and brings it home. With such consistency, they’ve probably tried every flavor, but their favorites are classics: Velvet Vegan (Jane) and Beans (Dan). When they came in for their weekly scoop in February, it was not an ordinary trip. They were taking a break from spending the entire day at Harris Hospital while Jane's mom, Polly Webb, had surgery. When they were in line, MELT’s manager, Mary Beavers, heard Jane and Dan discussing the surgery. Mary could have ignored their conversation. Jane could easily have downplayed the difficulty of the day. But Mary heard their story and decided to buy their ice cream. Polly’s brain surgery was followed by some time in intensive care, but afterward, she was able to stand up and eventually start walking again. Jane said the two-year ordeal has taught her mom to accept help, a lot of it coming from her husband, Mayes. Polly and Mayes have been married 60 years on May 31st and we call that a three-scoop celebration! Cheers to modern medicine, the Moughons, and Mary for spreading happiness!